Once you have created payroll categories, and created one or more schedules, you can generate a payroll summary. The name of the current time period and version being summarized is shown at the top of the screen. Displayed below the schedule name are several columns of information. The far left column, titled 'Provider', alphabetically lists the names of the currently 'Active' providers. The bottom entry in the 'Provider' name column is the word 'Total'. 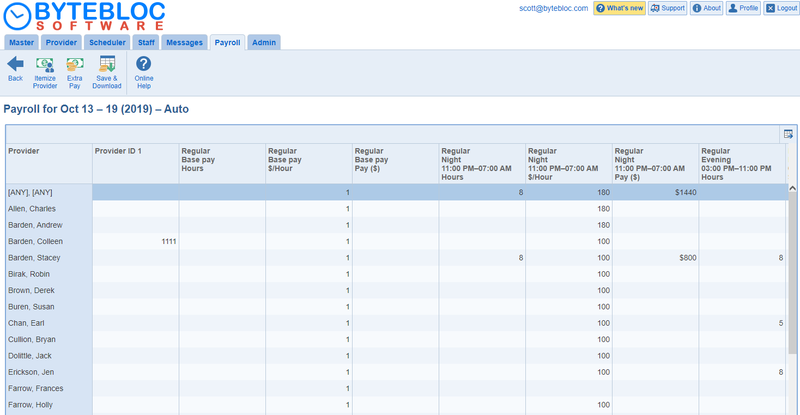 To the right of the 'Provider' column are columns containing cumulative payroll summary information for your schedule. The actual number depends on the number of 'payroll categories' you have created, with an additional Total column at the far right of the display. Below the title lines, each payroll category is subdivided into three columns, labeled from left to right as Hours, $/Hour, and $. (If you 'selected a currency symbol' different from '$', that symbol will instead be displayed.) Below the title lines are displayed the calculated cumulative values in that payroll category for each provider; values shown on the same line and to the right of each provider's name are the values pertinent to that provider. If you selected the 'Withholding' option from 'Configure Payroll', 3 extra columns will display, Gross pay ($), Withholding ($), and Net pay ($).